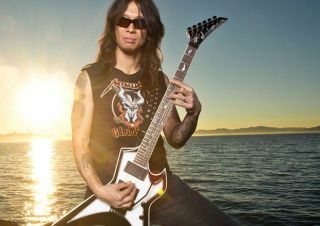 As part of our 2015 Summer Tour Survival Guide, we talk to Rob Cavestany of Death Angel about staying hydrated, his craziest performance injury and the best live show he's ever seen. Rob Cavestany and Ted Aguilar of Death Angel recently visited EMGtv to perform songs from their upcoming album, The Dream Calls For Blood. Kirk Hammett evidently knows how to throw a book party. The Metallica guitarist invited Bay Area thrashers Death Angel to perform at the release party for his new book, Too Much Horror Business. It looks like the rumors of a tour featuring Anthrax, Testament, Death Angel and Overkill were 3/4 true anyway.